I picked up this 1934 classic for 25 cents at the local library's book sale. Getting 12 excellent, culturally significant paperbacks for $3 made my day. This novella promptly demolished it, leaving me blowing my nose, wiping tears out of my eyes and lying awake through half the night. Valued in its time (according to a cover blurb) as second only to "The Christmas Carol," it may not be so well-known these days, though it has been the subject of an Academy Award-winning feature film (winning Robert Donat a 1939 "Best Actor" statuette for his role as Mr. Chipping), a 1969 musical film featuring Peter O'Toole, and a more recent TV movie. The story looks back over the long career of a beloved and lovable Latin classics and Roman history teacher at a private boys' school somewhere in England. It makes efficient use of its 113-page length to grab the reader's heart in a warm embrace of nostalgia, quirky charm, bittersweet romance, and respect for an honorable but under-appreciated profession (teaching) and the small, everyday acts of courage some teachers perform. The result is a powerful upwelling of emotion that lingers after the close. Part of the sadness one feels, I think, derives from the book's viewpoint that a person survives as long as he or she is remembered - but most things are forgotten in time. Mr. Chipping, affectionately known as Chips, spends a good deal of his long retirement recalling things whose memory will die with him - the names and faces of thousands of boys, for example; the softening, brightening influence of the young wife he buried so long ago; the... yup, that did it. I'm crying right now. Thanks a lot, Mr. Chips. I was unfamiliar with the work of James Hilton (1900-1954) until I read this. According to the British author's preface to the edition I picked up, he wrote this story on a tight deadline for a British magazine, adding that it flowed out of him more easily and required fewer alterations than anything else he had written. He based Chips on a combination of his own schoolmaster father and a couple remarkable teachers he'd had. Chips didn't become popular until it was reprinted in the U.S., after which it caught fire in his native land. It seemed everyone in the world remembered having a teacher like Mr. Chipping. Besides stories published in periodicals, Hilton also wrote 13 or 14 books during a 34-year career, including Lost Horizon - also made into a serious film (1937) and a musical (1973) - in which he coined the term "Shangri-La." I bet you didn't know that. Now you're beginning to sense there may be some importance to this guy, eh? His other titles, now that I've got you interested, include Catherine Herself, And Now Goodbye, Murder At School (a.k.a. Was It Murder?, under the pen-name Glen Trevor), Contango (a.k.a. Ill Wind), We Are Not Alone, Random Harvest, The Story Of Dr Wassell, So Well Remembered, Nothing So Strange, Morning Journey, and Time and Time Again. 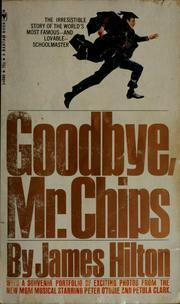 There is also a follow-up to this book titled To You, Mr. Chips.